with a reception on September 9th at 6 to 9 pm. 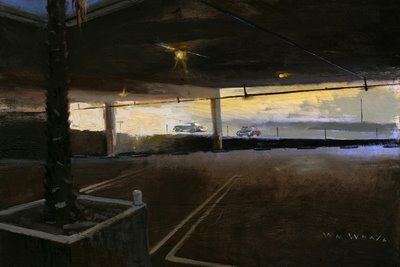 I went to Target the other day to get a prescription filled with the intent of killing time by taking more shots at the big abandoned parking lot across the street form it. I had done a PA painting in many months ago, (posted on my blog as "Palm Lot.") When I went across the street the big palms were gone. In frustration, I went back and looked about the Target parking for subjects, ending up in the underground lot. I found it kind of interesting that the palms were growing down there, I have no idea if they built the lot around them or planed for them, but I suspect they planted them. This illustrates what a weed tree Palms really are. A beautiful tree, but a weed will grow anywhere. I think the limited light focus on this one really delivers. This new direction is going places! Perhaps one day soon I can convince my Greek bride to let me buy one!!! Well now I know who wears the Evazone in your family. Is this on a panel? There are fine lines that look like they'd be fairly impossible to get on canvas. This makes me want to try PA, ASAP! I sees it but I don't believes it! You had me until the cars. Love your work btw. G-- yeah it's on wood. Who dat say who dat? You don't like cars in parking lots? hey mr. wray! sorry that i missed your show opening, but i'll drop by to see it sometime. i'm really interested in your work! i heard your plein aire painting class was cancelled and i was just wondering if you'd make sure and put a nice little blog entry up when it's up and running again. i'd love to join you! I don't know why I haven't looked at this one yet! I guess I'll be the tardy one this time. I lik how your eyes are dragged from the dark edges to the light outside, like someone's gonna pull you over to the edge and throw you out into the open sunlight. Don't you hate it when people leave their styrofoam coffee cups on parking lot planters? Nice painting, though. My regular class is shut down for the time being, but I will be doing a all day workshop on November 19th on location in the Burbank area. More info to follow. Just a underground parking lot they all are the same, we just don't look at them, we run into the store. We have all noticed or done it at one time or another . I like visual touchstones, no matter how crass. The fact is in this bottom line world, corporations find ways to cut down on disposing of trash, it's harder than ever to find trashcans and rest rooms, yet there are way more people.